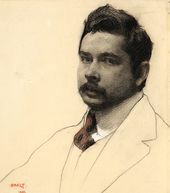 A prominent artist of the Silver Age of Russian culture, Léon (Lev Samoilovich) Bakst was also a notable figure in the literary community of his time. 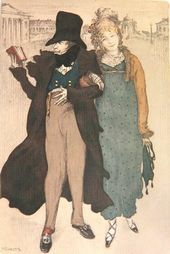 He was acquainted with, or a friend of many writers and poets whose portraits he painted and whose books he illustrated. 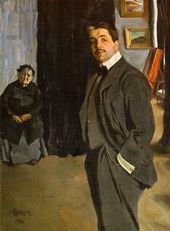 Bakst would retain his admiration for Chekhov throughout his life. One of his favourite writers, with whom he was personally acquainted, was Alexei Tolstoy, whose lithographic portrait Bakst created in 1909. The portrait was printed in “Apollo” magazine, which employed many prominent artists and writers of the Silver Age. 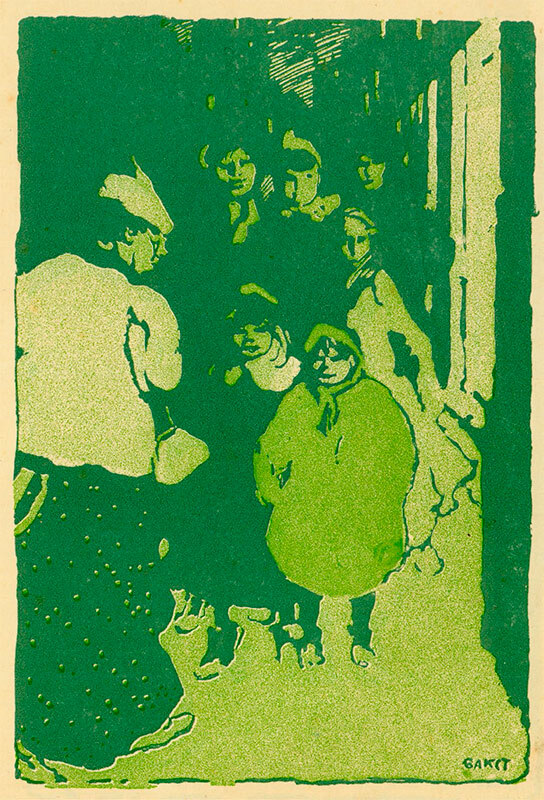 Bakst’s friends frequently asked him to design covers for their collections of poems or short stories: such requests produced the book cover for Sergei Gorodetsky’s collection of poems “Perun” (St. Petersburg, 1907), the frontispiece for Konstantin Balmont’s “Ancient Calls” (St. Petersburg, 1906), the cover for Maximilian Voloshin’s “Anno mundi argentis” (Moscow, 1906), and the frontispiece for Alexander Blok’s “A Snow Mask” (St. Petersburg, 1907). As chief illustrator at “Mir iskusstva” (World of Art) magazine, Bakst created not only the periodical’s image and cover, but also headpieces, vignettes and tailpieces for the works of Vasily Rozanov, Konstantin Balmont and Nikolai Minsky. 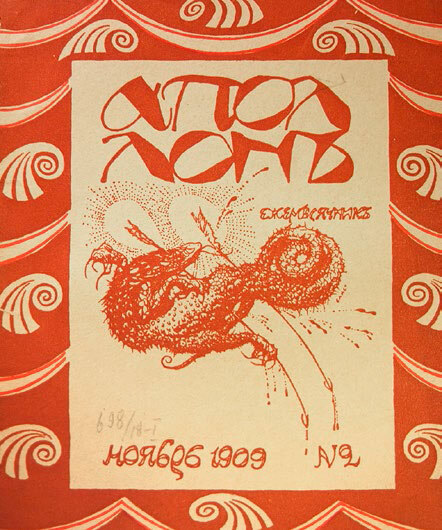 Bakst worked very carefully, producing not only a sketch for the magazine’s cover but also developing the idea at a further stage, going into every detail of the process of production of the magazine. 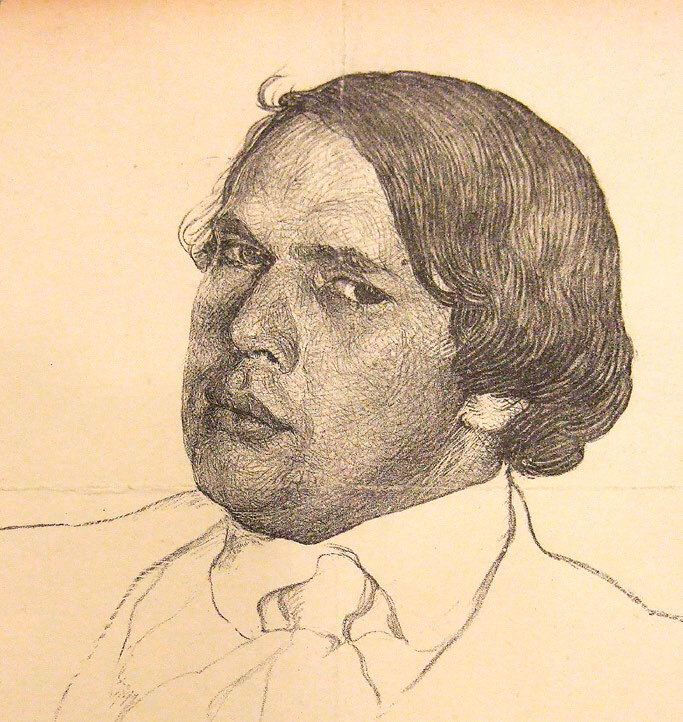 In December 1903 he wrote to Bryusov: “I’ve received your sketches and the one among them I fancy most is No. 1 - greyish-purple; green could be okay if you make it richer in tone. If only you knew how much time and energy we at ‘World of Art’ expend looking for the right colour for every new issue’s cover!” Ultimately, every new issue’s cover had a similar design but a different colour. 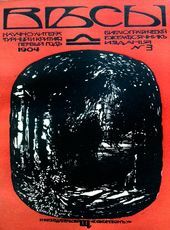 This story provoked anger in literary and artistic circles, and the artist told his fiancee about it: “The censors in Moscow disapproved of my cover for the ‘Scorpion’ almanac. Writers in Moscow are fuming over it; they had to cut a fragment and insert someone else’s (old) drawing into mine. The result: pele-mele [higgledy-piggledy]. 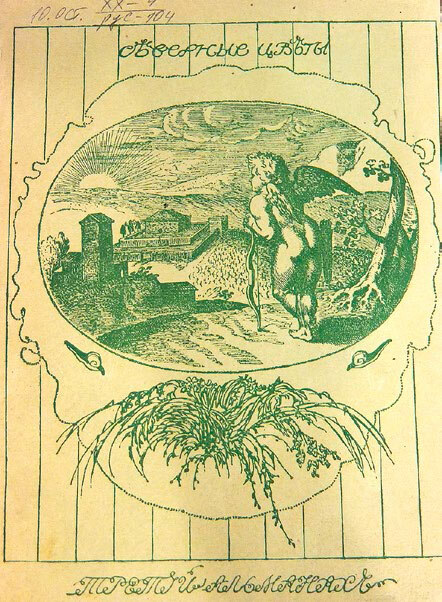 But the back of the book carries an explanation.” Fortunately, the sketch of the cover has survived, giving us the chance to rehabilitate Bakst. 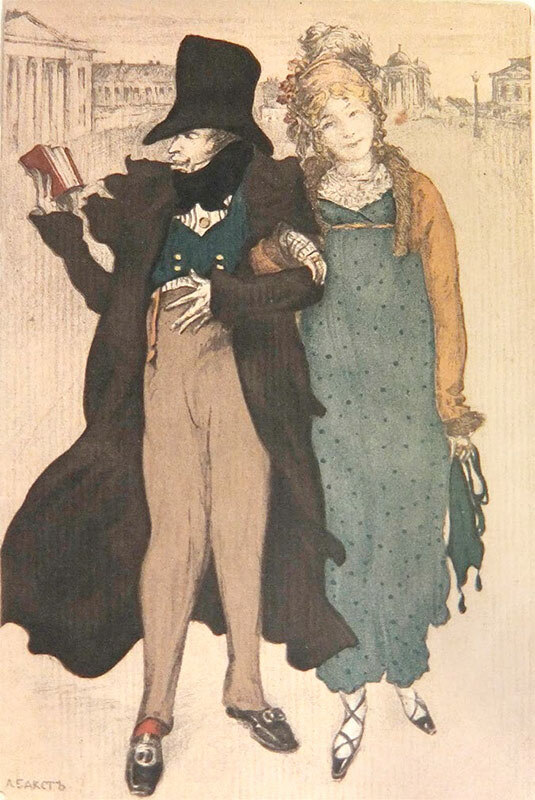 However, the poet did not distinguish between the artist’s words about a great LOVE, of which she was herself a preacher, and her habit of having numerous suitors at her feet. In need of sympathy, Bakst wanted to get his feelings off his chest, give expression to his love and longing for his wife who was absent. But Gippius believed she was the object of the artist’s yearning and included this episode in her “Journal of Love Affairs”. Although she noted: “On that day, on my way home from the editorial office, I thought: here is a person in whose company I’m bound to experience gaffes all the time because even if he felt something for me, he. was just lying at my ‘feet’. His tenderness hasn’t risen higher than my legs. He doesn’t need my head, my heart he doesn’t understand, while he found my legs admirable. 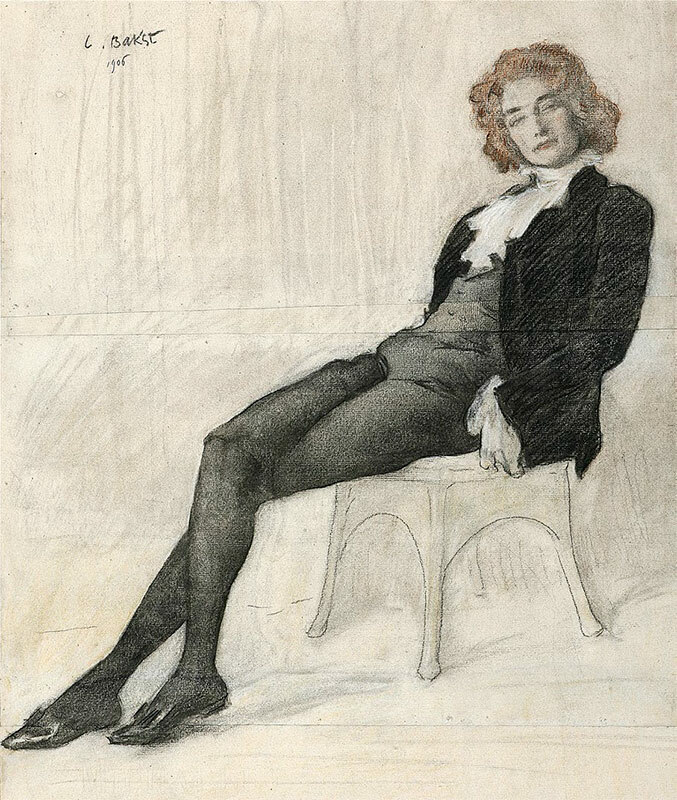 C’est tout.” An intelligent and sober-minded woman, Gippius formed a clear view of the situation: it was not by chance that her portrait created by Bakst in 1906 featured her legs prominently (she approved of the work). Gippius unintentionally contributed to the development of the painter’s literary talent. She later reminisced: “We decided once (when Bakst dropped by) to write a short story and set about the business right away. Bakst proposed the theme, and since it was very amusing, after some deliberation we decided to write it in French. 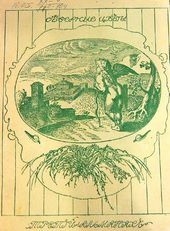 The piece came out quite well: it was called ‘La cle’ [The Key].” Not everybody was benignly disposed to Bakst’s literary endeavours. The poet Mikhail Kuzmin, in his diary for 1908, spoke of them quite disparagingly: “[Bakst] was nice and muddle-headed, and read his opus: a piece of crap, of course.” Kuzmin and Bakst, meanwhile, were getting along just fine; it was just that the poet had more appreciation of his acquaintance’s artistic talents. In December 1906 Bakst wrote to his wife: “Today the poet Kuzmin called on me, asking to make a book cover for his poems. 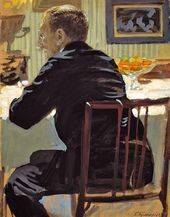 I’m going to spend this evening at his place, the guests - V. Ivanov, Remizov, Somov, M. Voloshin, etc. 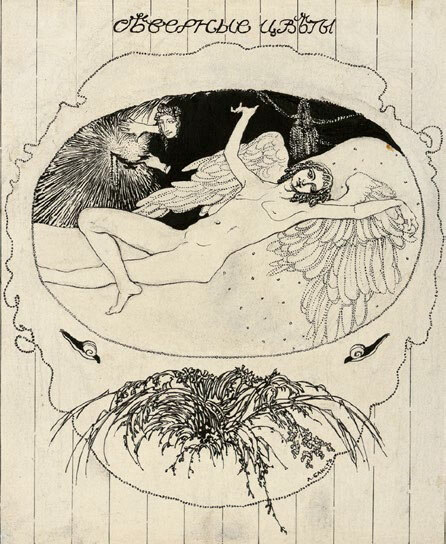 There will be a reading of new pieces.” In fact, the writers and artists mentioned were part of the “in crowd” of writers and artists, to which Bakst also belonged. The friends decided to immortalize the “Northern Hafiz” society by publishing an elegant and luxurious book of poems written by its members. 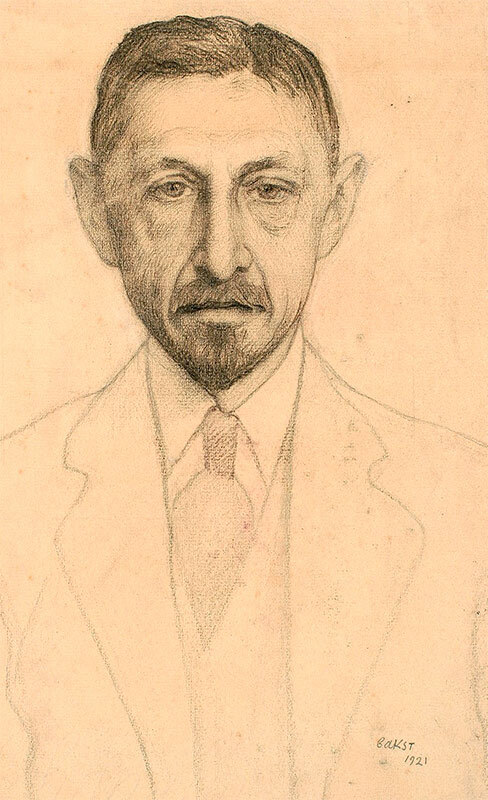 Somov wrote to Kuzmin: “The book is going to be called ‘Northern Hafiz’, it will have an appendix with portraits of all Hafizites, printed in colour from original pictures which I and Bakst will produce, in the style of Persian multi-coloured miniatures with a certain idealization or, rather, stylization of Hafizical characters... Of course, the book will be anonymous and only the resemblance in the portraits will lift the veil of mystery a little.” Regrettably, these plans were never to be realized, and by the middle of 1907 the society had disbanded. 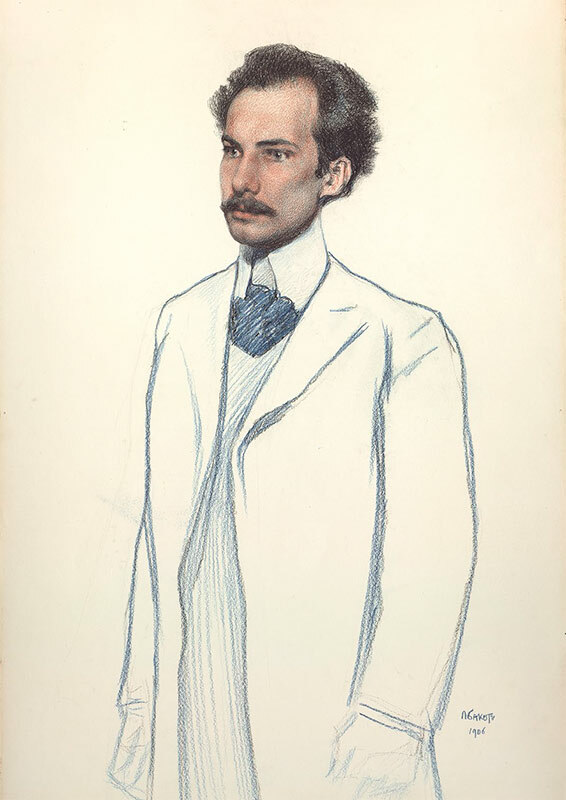 Bakst created portraits of some of its members - Somov, Andrei Bely and Gippius - but these images were produced later on a commission from Nikolai Ryabushinsky, publisher of the “Zolotoe runo” (Golden Fleece) magazine of literature and art. All of the above relates to the first stage of Bakst’s life and artistic career. 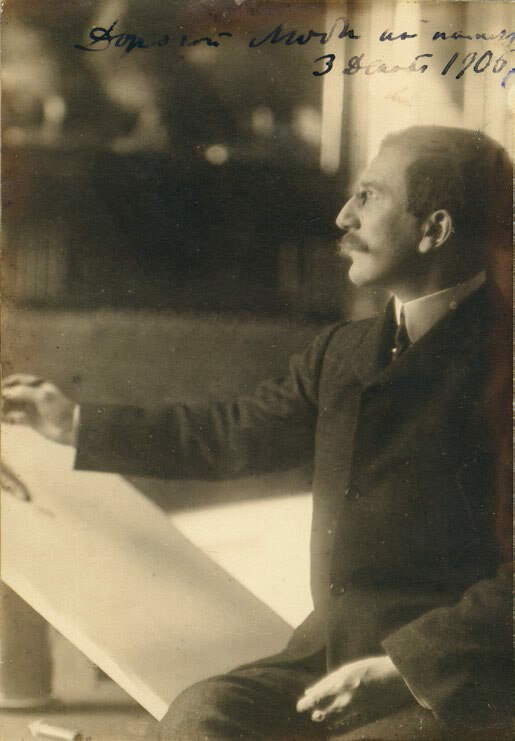 The turning point came in 1909-10, when the smashing success of Diaghilev’s “Ballets Russes” in Paris brought him international fame, as the chief designer of “Cleopatra” and “Scheherazade”. In Paris he became a symbol of success, a trend-setter, a popular artist. 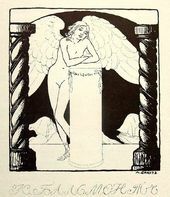 There was a literary component, too: it was no accident that the programme of “Scheherazade” contained the phrase “libretto by Bakst”. 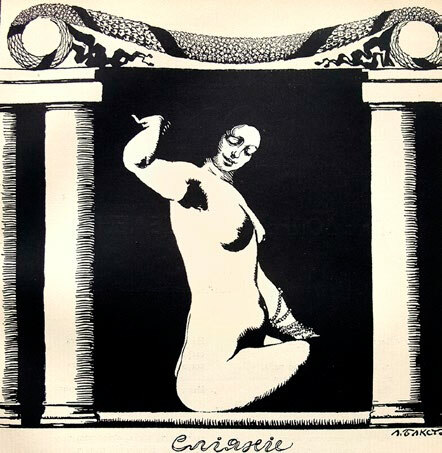 And although Alexander Benois attempted to contest Bakst’s authorship, the artist, whose name was now refashioned in the French manner as Léon Bakst, continued to create librettos for ballets like “Artemis troublee” (Artemis in Confusion), “La nuit ensorcelee” (Magic Night) and other works, and also started writing for the screen. At the end of his life Bakst set about writing a memoir. 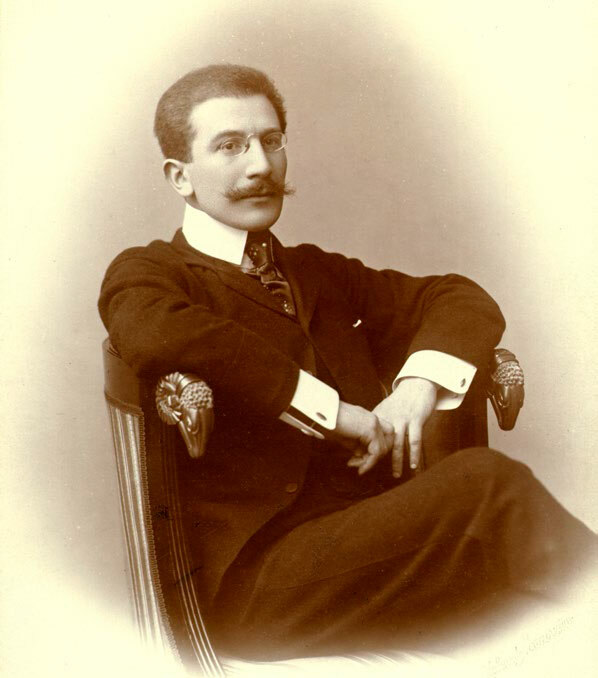 “But this is Bakst, too; heavier than before, now he’s one immobile mass, the hair no longer bristled up but sticking to the forehead; and yet, the same slyly smiling eyes, sad and schoolboy-like - he’s the same: unbearable, vexing, naive, mistrustful - and plain. This is Bakst 20 years older, Bakst in fame, happiness and wealth. Essentially, this is the same Bakst. Sure enough, the artistic talent eclipsed the literary talent; the book of travel notes “Serov and I in Greece” would remain the only book published in Bakst’s lifetime. Its release did not go unnoticed, and Bakst was flattered by the comments of acclaimed writers. 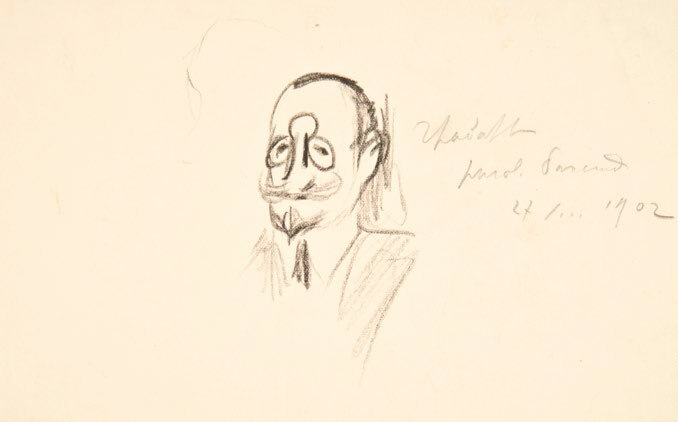 But whereas Bunin, whose portrait the artist had produced shortly before the travelogue came out, only praised the book and went not a step further, Gippius was more attentive to the artist’s writing. “I read your little book, so mirthful, sparkling and youthful, in one sitting, in 30 minutes; and it was as if my former self spent these 30 minutes with your former self. For there is a lot of Serov and quite a large bit of Greece there, but both Serov and Greece are introduced through you; so, it’s you who occupies most space. I only wish the book had more text. I’ve always known you are very good at writing. And although I understand that this sort of fame is not something you go for, you’ve written something else, haven’t you? Where is this ‘something else’ then? You should send it to me, really. I am your very good and very grateful reader.” Gippius could not believe that the book was the sole “piece of writing” the artist had produced: again and again she would ask him to send her something else. There followed an exchange of letters, with the result that Bakst felt a desire to write some autobiographical notes, or something similar, very intimate notes that would not depict the events of his life as such but highlight his innermost feelings. 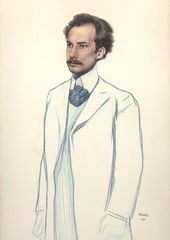 Gippius encouraged him: “I will look forward to the moment when you get a desire to publish something from your own ‘Innermost’.” The artist liked the idea and even set about explaining his vision of the future literary work; Gippius tried to dispel Bakst’s doubts and reassure him in his determination to put down on paper his “innermost” recollections with an element of fiction, a creative spin. “Yes, yes, not ‘inventing stories’, but recalling something that is your own, that happened or almost happened - things wished for... Only reminiscing, about the past, and about the future. Things wished for, produced and not produced.” Such enthusiastic admonishments had their effect. “Cruel First Love” was the tentative, provisional title of the autobiographical novel which Bakst started in 1923. 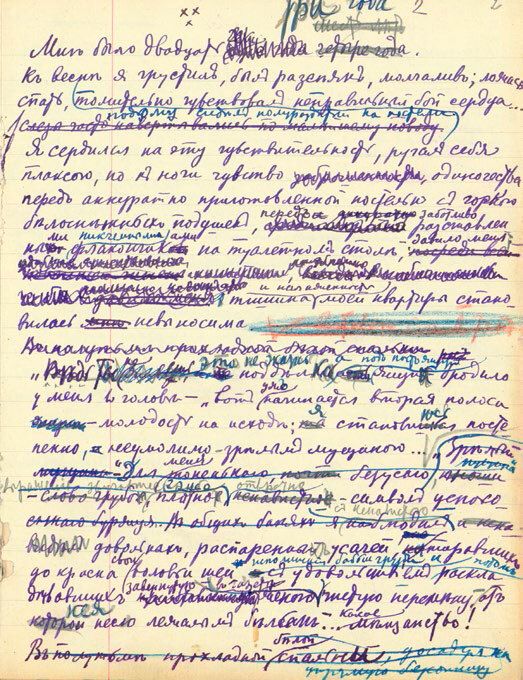 Two thick notebooks filled with tight handwriting remain, with lots of corrections, phrases crossed out, and insertions in the text. The artist was recalling events that had happened 30 years previously. 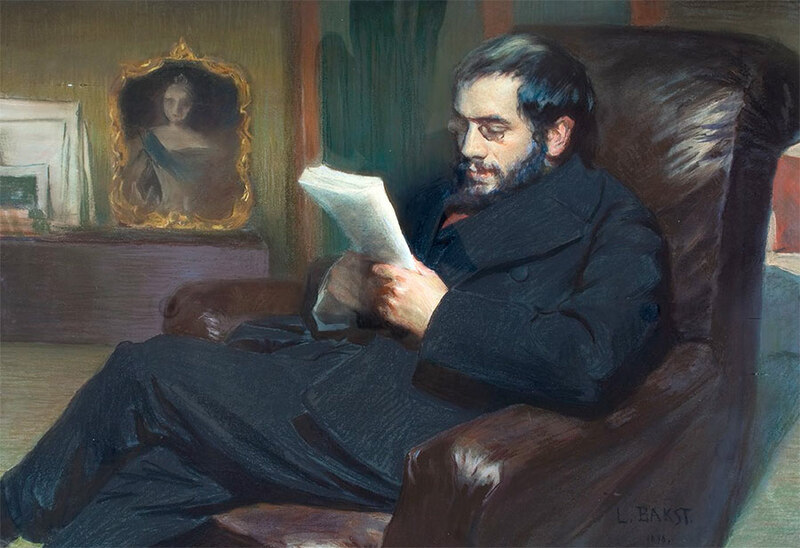 He changed the names of all the real-life persons featured in the novel except for his own and described the days of his youth, his passion for an actress of the Mikhailovsky Theatre’s French troupe Marceille Jausse, the experience of tutoring the children of Grand Duke Vladimir Alexandrovich in drawing and painting, and many other things. 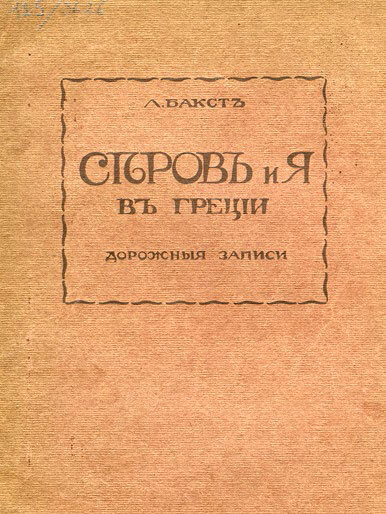 The backbone of the novel was not its plot but the main hero’s mood and emotions, the things he and Gippius had discussed in their letters to each other. 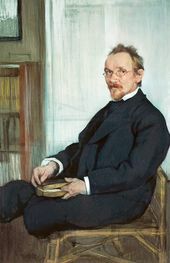 The artist planned to publish his memoirs under the title “Spring in St. Petersburg”, and its action is set in early spring in the “northern capital”. 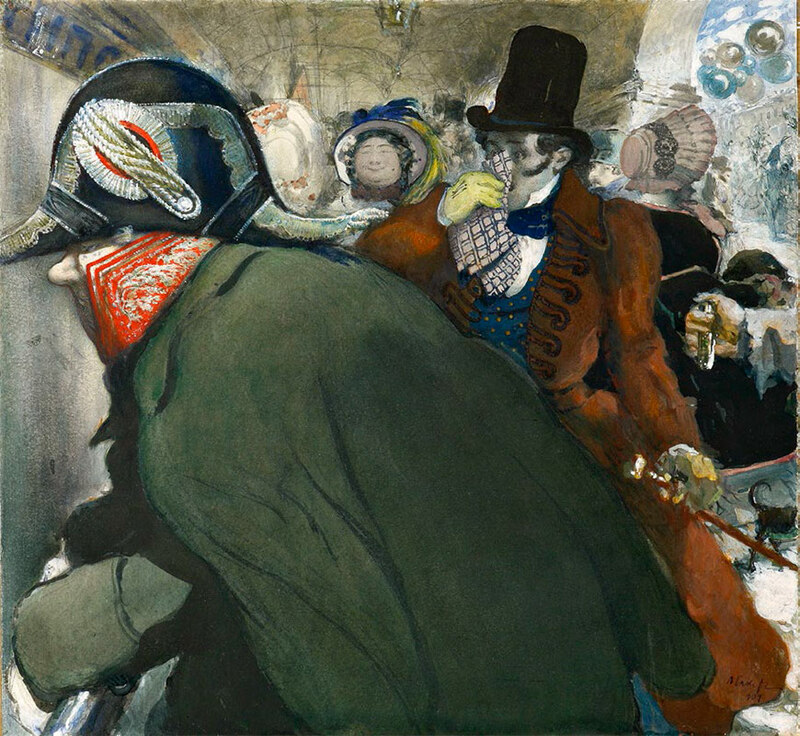 Visions of rather drab and dreary streets blend with the main character’s life, and the city itself, with its character and changes in mood and appearance, becomes a player in its own right. 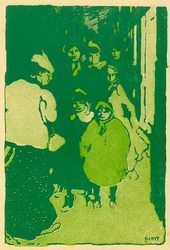 The novel’s story and the feelings of its main hero cannot be separated from the slightly mystical image of St. Petersburg at the end of the 19th century: “Night has fallen - I was still roaming - turning around corners; I reached a misty Fontanka, then turned on to Gorokhovaya with its wet glistening cobblestones. Near Pokrovsky Square everything urged me to walk down to Mogilevskaya, to Sennaya. Suddenly it became even warmer and darker. There was a premonition of verdure, my heart ached wistfully - I wished to run, to find something definitive. Amid the warm dampness, in the dirty-black and warm silence, passers-by looked strange, mysterious. 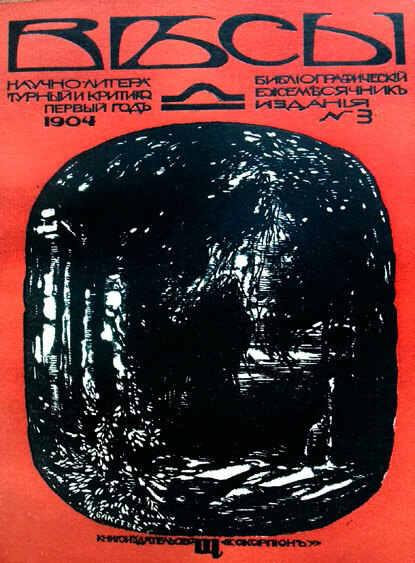 Tightly cocooned, sullen, treading noiselessly in valenki [felt boots] and rubber overshoes - hailing from [novels by] Dostoevsky, from [stories by] Edgar Allan Poe.” The artist’s literary piece seemed to include pictures that were never created. Bakst’s signature bent line, the fanciful plot and slightly spicy flavour of artistic life, and the bright but harmoniously matched colours - all of that is present in the novel, just as it is in Bakst’s paintings and stage designs. 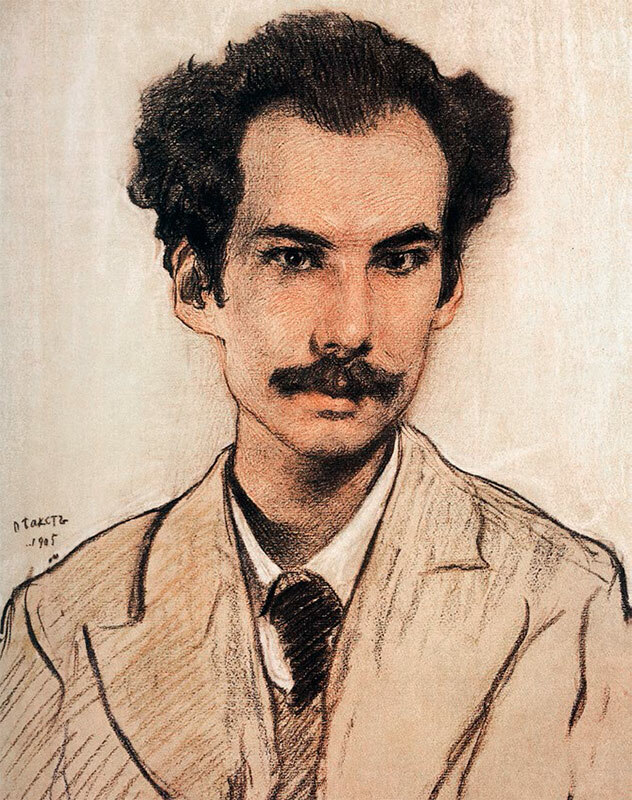 Thanks to the creative atmosphere that prevailed in the turn-of-the-century literary and artistic circles in which he moved, Bakst had the opportunity to fully realize his diverse talents. 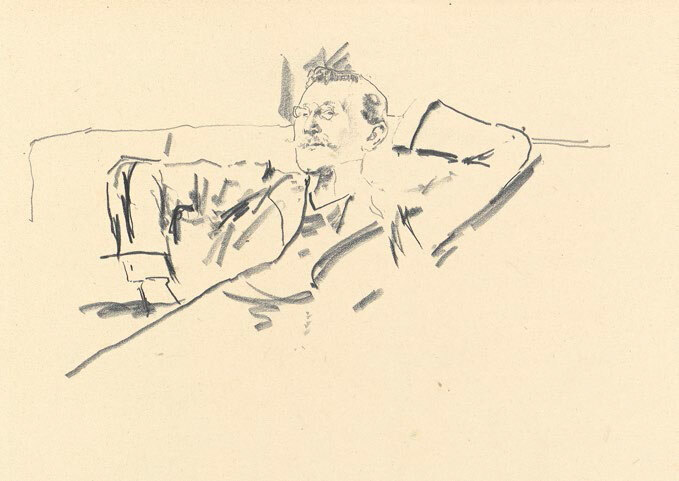 A prominent representative of the Silver Age, at the end of his days the artist tried to take stock of his life: he was aware that “there is only one important tense - the present; only one significant moment - the immediate one. These minutes of lucidity are full of agony. But these are the wisest and most real minutes for our mind. During these minutes we see ourselves ‘at full length’, as it were, such as we were created by the universe, as travellers on our single journey of life.” Only a true writer, artist and individual could say this. Department of Manuscripts, Tretyakov Gallery, fund 111, no. 53, sheet 3. 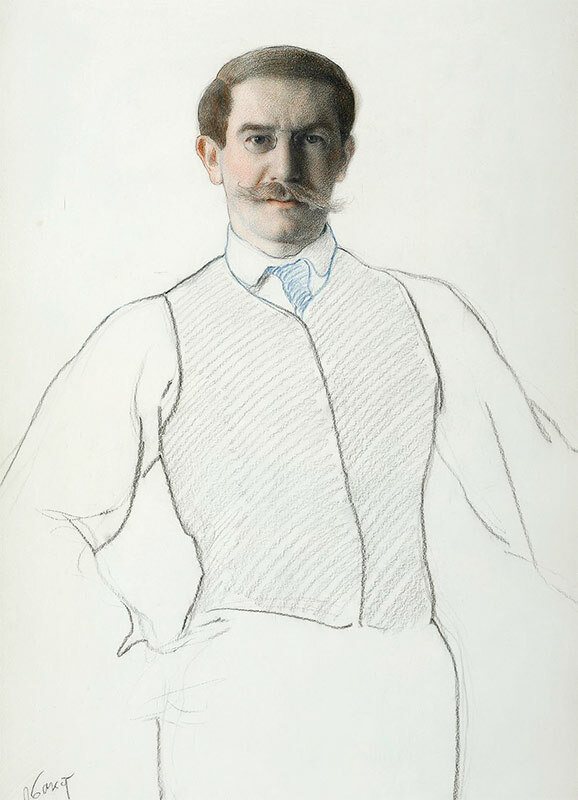 Bakst, Léon. “My Soul Is Open”. 2 volumes. Moscow, 2012. Vol. 1. P. 71. Hereinafter - My Soul. 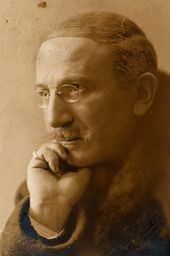 Gippius, Zinaida. “Live Faces. Recollections”. Tbilisi, 1991. Vol. 2. P. 209. 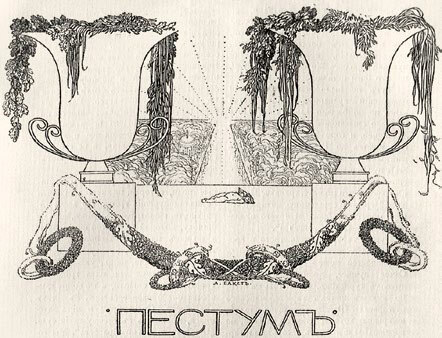 “Mir iskusstva” (World of Art), 1900, Nos. 16-17. Pp. 85-88. 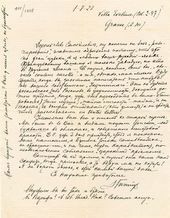 Department of Manuscripts, Tretyakov Gallery, fund 111, no. 140, sheet 2 (obverse and reverse). My Soul. Vol. 2. 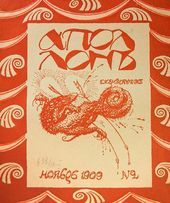 P. 80. 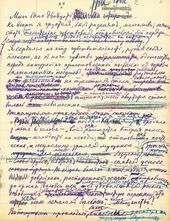 Department of Manuscripts, Russian State Library, fund 386, box 69, no. 24, sheet 3. Department of Manuscripts, Tretyakov Gallery, fund 111, no. 77, sheet 2 (reverse). 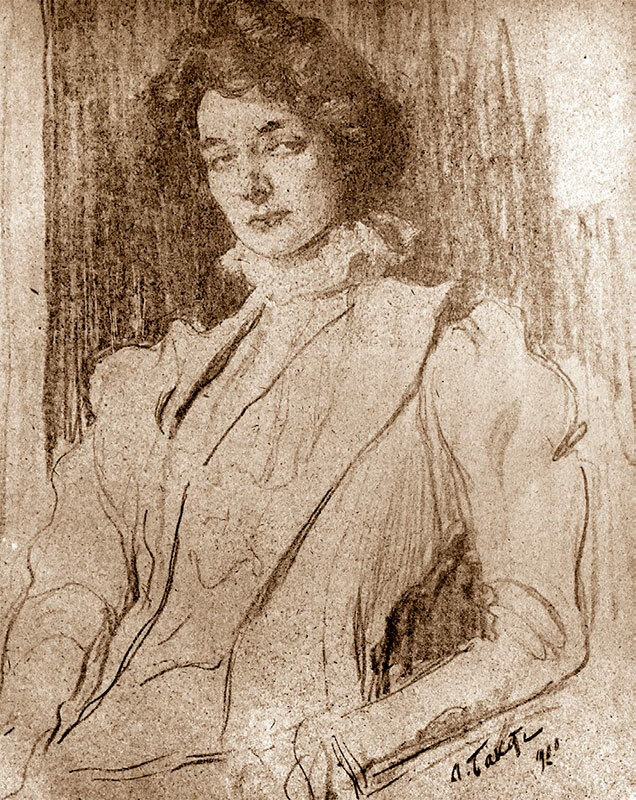 Gippius, Zinaida. “Journals”. Moscow, 1999. Vol. 1. P. 85. 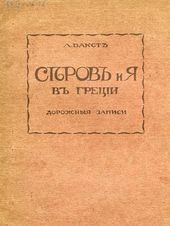 Gippius, Zinaida. “Dreams and Nightmares”. St. Petersburg, 2002. P. 389. Hereinafter - Dreams. Kuzmin, Mikhail. “A Diary. 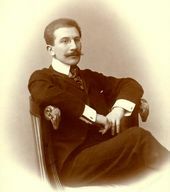 1908-1915”. St. Petersburg, 2005. P. 93. Department of Manuscripts, Tretyakov Gallery, fund 111, no. 224, sheet 1 (reverse). Somov, Konstantin. “Letters. Journals. Opinions of His Contemporaries”. Moscow, 1979. 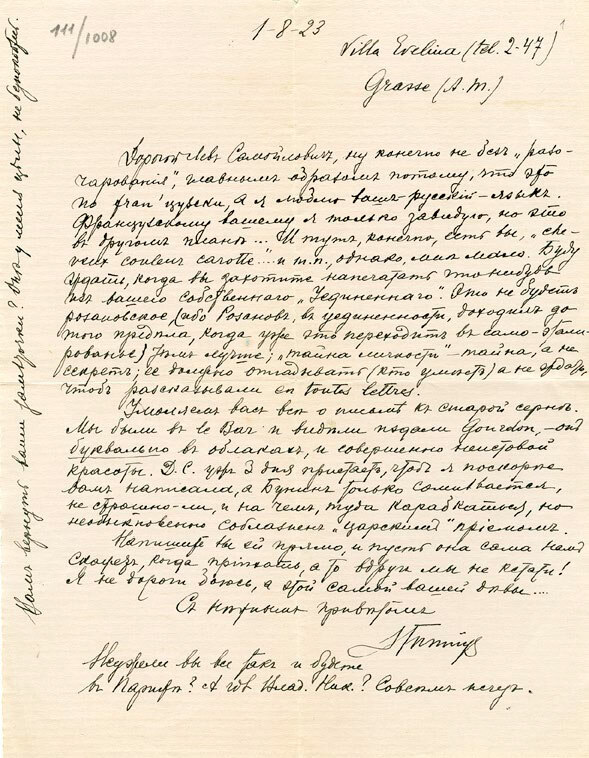 P. 95. Department of Manuscripts, Russian Museum, fund 137, no. 671, sheets 27-28. Bely, Andrei. “Between the Two Revolutions”. Leningrad, 1934. P. 67. The house survives today: the address is now 24/27 Liteiny Prospect. Bely, Andrei. “Beginning of the Century”. Moscow, 1990. Pp. 478-479. Department of Manuscripts, Tretyakov Gallery, fund 111, no. 54, sheet 1. Department of Manuscripts, Tretyakov Gallery, fund 111, no. 1007. 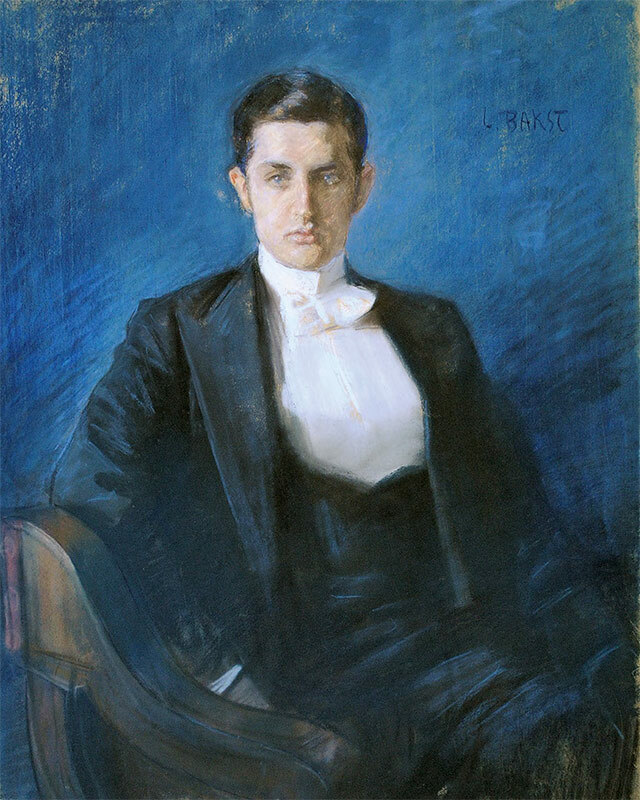 Benois, Alexandre. “My Memoirs”. Vol. 1, book 3. Moscow, 1990. P. 624. 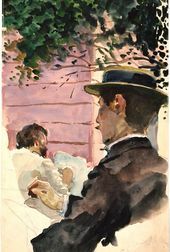 “Serov and I in Greece”. Berlin, 1922. Department of Manuscripts, Tretyakov Gallery, fund 111, no. 1006, sheet 1. Ibid. Fund 111, no. 1008, sheet 1. Ibid. Fund 111, no. 1007, sheet 1. My Soul. Vol. 1. P. 178.